Built-in Wi-Fi and a touchscreen, what else can the SH100 deliver? As part of the Cutting Edge range in Samsung's line-up, the SH100 shouldn't really be into looks. It should be all about the technology, but what Samsung has produced is a snazzy little unit stuffed with features. With an oversized lens barrel to hold the 5x optical zoom this gives a range of 26 – 130mm in 35mm terms. On the back is a 3-inch touch sensitive LCD screen with 320,000 dots (106,666 pixels) with all the features and modes accessed directly from it. Within the menu, there are four pages of things to do ranging from Smart Auto shooting mode, to Video, Email, Set-up menu, Photo Editor and Remote Viewfinder. Herein lies one of the problems with the SH100. All these modes are pretty impressive in their own right, but there's no semblance of order to them. If you want to use the Program mode, it's on the first page but if you want to use the Macro mode, it's on the third page. This well used mode comes after more obscure options such as Vignetting and All Share. 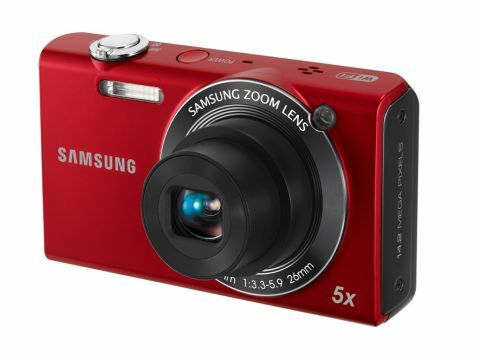 The SH100 features Wi-Fi capability, The camera will upload automatically to Facebook, Photobucket or Picasa web albums, YouTube and the Samsung community website. It also features PC Back Up which will automatically detect a computer with Wi-Fi and will download the pictures you've taken from the camera straight onto the computer. We uploaded a picture from the camera to Facebook. A full resolution picture took less than a minute to get onto the site with minimal fuss at a low broadband connection speed. If a Wi-Fi connection requires a pass key, it will only let you use it once the key is entered. After that, the camera will remember it though. If you also own a Samsung Galaxy S smart phone, the SH100 will link up to the phone using the Wi-Fi and allow you to remotely control the camera which is great for self portraits or group shots. It's also DLNA (Digital Living Network Alliance) enabled to allow you to view pictures on any HD television regardless of its manufacturer. The touchscreen can be used a bit like a smart phone and you have to wipe the pages to move from one to the next. We found that it's best to use the small stylus that comes in the box because the camera is more receptive to it than a finger press. Thanks to the touchscreen, the SH100 has four AF options, two of which are touch related. The standard modes are centre spot AF and Multi AF, while the touchscreen versions are One touch shooting and Smart touch AF, the latter of which locks onto a subject and keeps focus on them until the picture is taken or they leave the frame.